Wow! Can you believe that Christmas is just a few days away and then we go into 2018? My days have been filled with lots of love and encouragement over the last few weeks. Friends truly can be the best part of ones life. I have missed all of you from last week and can't wait to see what you have all been up to. Right now I have my beadwright.com closed. This has given me time to just play in the art room, get things organized in my house, and just have no stress. I love it!!!! Some of the art I have been playing with is negative space art. I am loving it so much! and it has been selling. Here are a few more pieces. To all who come to my blog I am wishing you a happy Christmas in which ever manner you celebrate, and the best ever 2018. Here are my elephants. The texture I am getting is simply amazing and these look so much better in real life. Click on the photos to see the texture. I have a space on my wall that has paintings from my mom and grandmother. I wanted to add my own touch to the group and it worked out pretty well. Again great texture. Like a lot of people I have ravens that decorate my house. 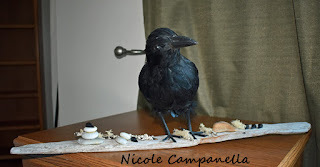 My Mom and I have been connected to Raven most of our lives and now that Mom is gone when ever I see a certain Raven in the yard I know it is her. 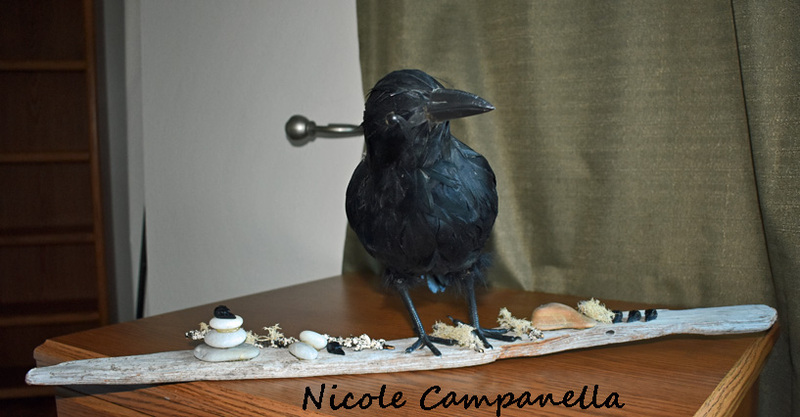 I had this Raven sitting on top of my door to my art room and decided she needed a new home. She now sits in my front living room window. OK one last thing. 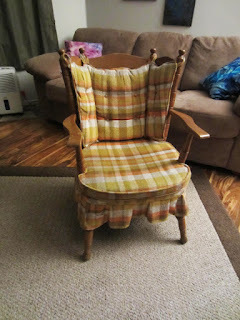 I have an idea that I want to try and I needed an old chair. I got this at the thrift store for $8.00 Stay tuned to see how I change this out. I am so excited to get started on it. The green bulbs on a dark background are adorable. Wishing you a Merry Christmas! The textured elefants and onions are great and wow even your mother and grandmother were artists! Love to hear that you see your mom in every visiting raven now - This sounds wonderful.I am really looking forward to seeing what you will come up with this chair! Wishing you and yours a beautiful Christmas and the best 2018 Nicole! 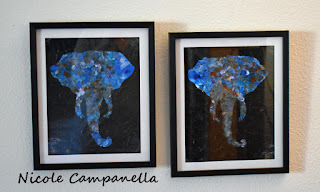 Beautiful art-love the texture you have achieved with color. Excited to see what you're going to do with the chair! Best wishes for a Merry Christmas and happy New Year! Merry Christmas Nicole! Can't wait to see what you do with the chair, your art is beautiful this week! Merry Chistmas beautiful soul! Gorgeous artwork! I'd give you the top award for most improved artist this year for your amazing portraits! You've come a long way baby! I am so impressed with how well they all turned out! 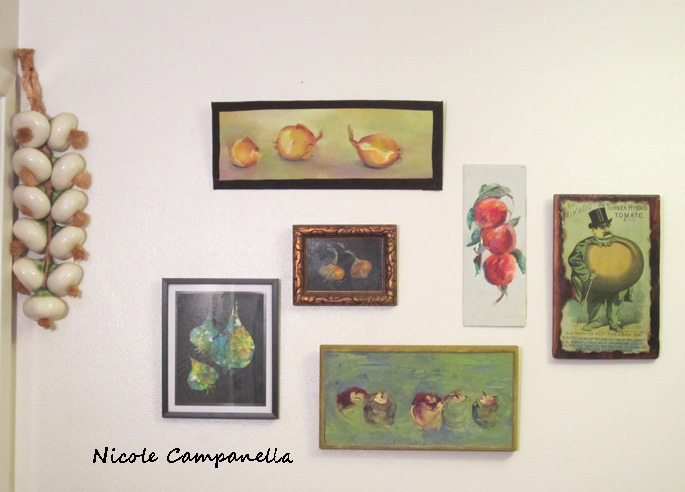 Your wall looks beautiful with your work added! I agree about friends! Have a wonderful holiday! Ohhh thank you so much. I feel like I have improved. It is a great feeling. wow!! I love the elephant heads the most! I love negative space art too! It's so much fun to see how images appear. Love the texture in your works! And like the others: I'm looking forward to seeing what you will do with the chair! Hope you'll have lots of time to just play in the next weeks! Enjoy your holidays, and have a safe trip into the new year! Love the art today and can't wait to see what you so with the chair:) I haven't been around much lately but hoping that will change with the new year. love your elephants :D Merry Christmas! Merry Christmas My Beautiful Friend!! Wishing you and your loved ones, so many blessings for Christmas and for 2018!!! Thank you for being who you are! Your art pieces are amazing! I love the grouping on the wall! I'm glad you moved your Raven! She is beautiful! I can't wait to see what you do with the chair! Big Hugs! Your art today is outstanding. Hope someone got your art for Christmas!! Wonderful creations ~ would love to know what you are using for the medium ~ Lovely post too! great art as always in your place. Good to know you are enjoing your artwork. Will be nice to see what you will make of he chair. 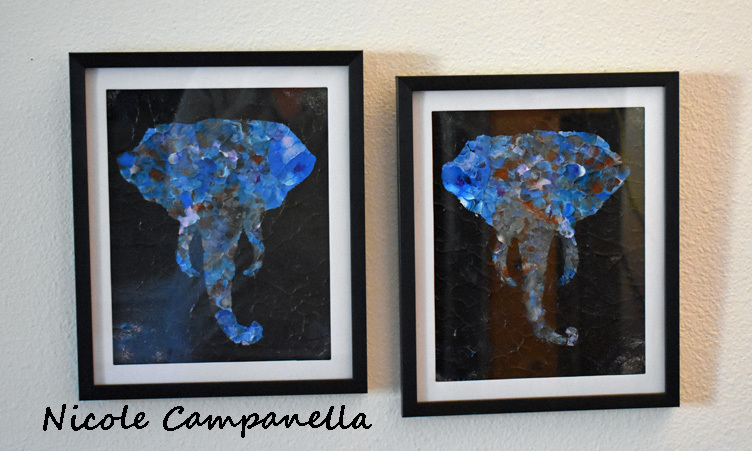 Your elephants are beautiful and you "sound" so excited about the art you have been making and your plans for the chair. Wishing you a Merry Christmas! Negative space is something is been meaning to play with as well, thanks for your reminding inspiration. 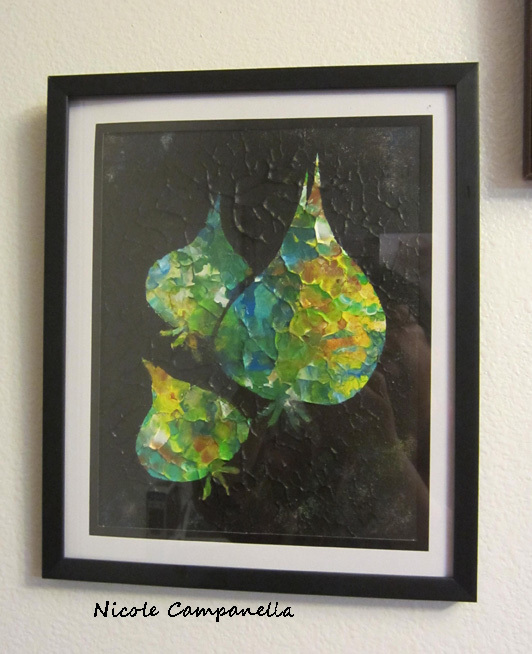 Your negative space art is compelling! What a great find the chair was, I look forward to seeing how you transform it. Thanks also for being such an inspiration!